When I think of summer, I think of watermelon – cool, sweet, juicy watermelon. And, picnics – warm, summer days in the park with my kids. Sadly, summer will be over before you know it. There are only a few weeks left for lazy picnic lunches in the park. To help you enjoy those picnics even more, here are 5 watermelon themed crafts to make your next picnic a fun and whimsical one. And, have you tried Cake Mama’s oh-so-cute sugar cookies yet? They would be the perfect addition to a late summer picnic. Better make them now before the summer sneaks by! 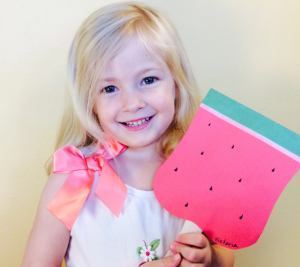 Cool off and keep the bugs away with these cute, watermelon paddle fans. Fold a piece of your cardstock in half and trim the two halves so that you have two rectangles roughly 5” x 6” each. If you like, round the edges of each half for a more decorative shape, but make sure to keep one 5” end straight for the top of your watermelon. Glue 1/3 of your wavy craft stick to the bottom of one piece of cardstock. 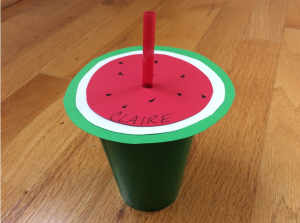 Glue the other piece of cardstock over the craft stick to sandwich it between the watermelon shapes. Apply the green masking tape across the top edge of your paddle fan on both sides. Apply the small white washi tape just underneath the green tape or gently color a small stripe with white chalk. Use your marker to draw seeds randomly over the red cardstock on both sides. Keep dirt and bugs out of your drinks with these personalized cup covers. Use your compass or circle template to draw a circle on the green cardstock that is about 1” larger in diameter than the top rim of your cup. Then draw a somewhat smaller circle on the white, and a slightly smaller circle on the red. Cut out your circles. Glue the disks together – green on the bottom, then white, then red – and, using your scissors, carefully punch a hole directly through the middle of the circle stack. Draw seeds on the red circle. Personalize the cup cover with a name. Place on top of filled cup. Insert straw through the hole. 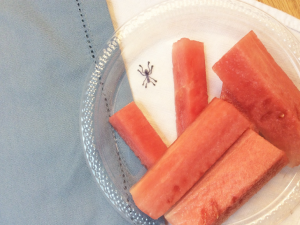 Add some fun to your picnic with this prank craft. Turn plate over so back side is facing up. Stamp or draw a bug or a few bugs on the under side of the plate. Once they dry, the bugs should be visible through the plate to your unsuspecting guests! Lightly spray sealer over black ink to keep it from smudging. Follow directions on the sealer container for safety procedures and drying times. Kids will enjoy practicing their seed-spitting technique with these straw and paper seed shooters. Bonus idea: STEM! Cut a small rectangle, 2” x 3”, from the black paper. 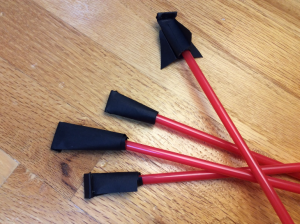 Roll this paper piece around one end of the straw to make a loose tube and secure the paper to itself with tape. Make sure it is loose enough to slide off of the straw easily. Fold over one end of the paper tube slightly. Fold a second time slightly and secure with tape. Think of folding over the top of a lunch bag. Blow through the open end of the straw to propel the “seed” into the air. Have a seed-spitting contest and measure the distances you send each “seed” flying. You can turn this project into a STEM activity by directing children to vary the shape of the “seed” by changing its length, adding fins or nose cones, etc. You will be surprised at how differently each “seed” flies. Add some sophistication to your outing with cloth napkins. Pick up some simple, blue cotton napkins – I found inexpensive ones at Target – and you’ll have blue skies ahead for your party. Spread out your napkins on a protected surface and make sure you are wearing old clothes. No ruining your favorite shirt with bleach! 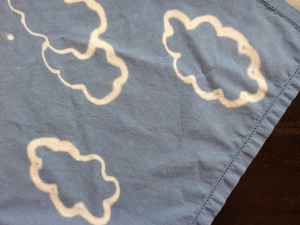 Using your cloud template or stencil, or free-handing if you wish, shake the bleach pen well and draw clouds in various places on your napkins. Be sure to let some clouds “hang off” the edges here and there. Allow bleach to work for 5-10 minutes (no more than 30). If needed, scrape off excess gel with a small piece of cardboard or plastic. Discard. Hand wash the napkins in a sink full of warm water to remove bleach from fabric. Dry in your automatic dryer or hang in the sun. Press, if needed. So, start planning your end-of-summer watermelon party today. 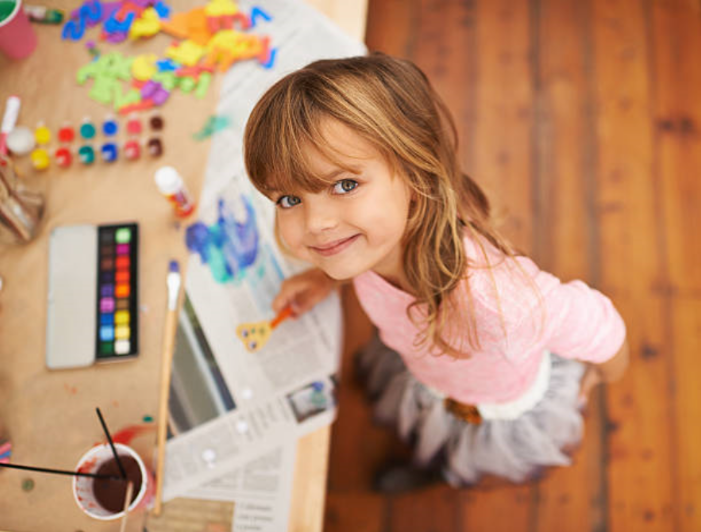 The Picniic app will help you view it on your calendar, plan your meal, and make a to-do list for the crafts you choose. Enjoy the final sweetness of the summer!